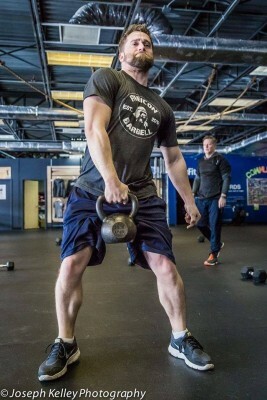 Brett earned a CrossFit Level 1 Trainer certification with his Crossroads grant and intends to coach veterans and athletes, both adaptive and able-bodied. He currently is working with the owner of a CrossFit gym to set up a seminar and class. A back injury suffered while serving in Iraq led to Brett’s medical retirement from the U.S. Marines. He has traumatic brain injury, degenerative disc disease with spinal stenosis and lumbar neuropathy, and post-traumatic stress disorder. “I wanted to be a Marine for the rest of my life,” he said. Since his medical retirement prevented that, he turned his efforts towards coaching others and improving himself. Motivated by his two children and his health, he golfs for rehabilitation (“while losing a ton of golf balls”), rides his bicycle when time permits, and does CrossFit several days a week, unless he’s experiencing migraines or debilitating back pain. He also coaches instructional T-ball to his son and other four- to six-year-olds. “Once I had kids, I quickly realized the necessity of being able to move, fast sometimes, and also to lift things— babies for instance. And I want them to see that their father is capable of doing things, at least sometimes,” he joked.